If you regularly handle hazardous materials, you need a hazmat storage building you can count on to be safe and compliant. 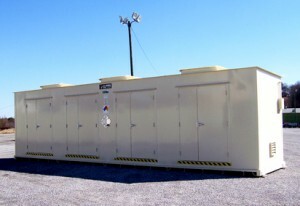 U.S. Chemical Storage offers unbeatable hazmat storage solutions. There’s no substitute for a 100% custom storage building that is specially designed to mitigate hazards associated with your hazmat storage. When you’re buying a building for your hazmat storage, you need total control over the building’s features. Our hazmat storage buildings are fully customizable, giving you the flexibility to design a storage building specifically tailored to suit your needs. Our hazmat storage buildings are designed to bring you the highest safety standards in the industry. This means that, through U.S. Chemical Storage, you can safeguard your personnel, community, and even your environment from the dangers associated with hazardous materials. 100% Customizable means that we engineer your hazmat storage building with the features and specifications required for safe storage of your specific hazardous materials. With our optional accessories, hazmat storage safety is achievable – we help you by going beyond government compliance to safeguard your valuable assets. EPA, OSHA, and NFPA each have codes and standards regarding safe and proper hazmat storage. By achieving safety within your storage building, you’re a step closer to achieving total compliance. Understanding government regulations can help you maintain a safe environment within your facility, protecting your personnel and community from potential hazards. Codes and regulations are in place to safeguard the community from these hazards, and heeding them not only protects you from harm, but it protects you from fines you may incur down the line. That is why U.S. Chemical Storage offers custom hazmat storage buildings – to facilitate the hazmat storage process, and to bring you total safety and full compliance. Check out our options and begin the process today.